ActioNet’s Energy Business Unit’s Germantown Maryland office partnered with The American Red Cross host three recent blood collection drives. The 72 donations received represent over 200 potential lives saved. 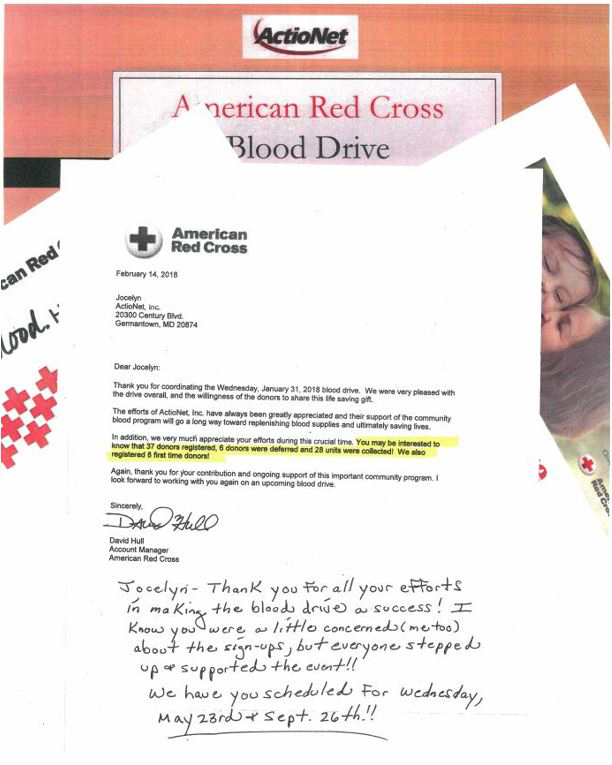 ActioNeters worked with the American Red Cross to convert one of our conference rooms into a blood donation center, recruit, register donors and complete the collection process. The American Red Cross supplies 40% of the country’s blood products supporting many communities and hospitals every day of the year, including days when emergency situations are at hand. When families and businesses are suffering the effects of natural disasters, many people ask the question “what can we do to help?”. One way we can help is to donate blood in our own Community. When our Community has an adequate blood supply, it is also able to support not only their own hospitals but those in other areas of the Country during their times of low supply/shortage. The need for blood is constant and only volunteer donors can fulfill that need for patients in our local Communities. Nationwide, someone needs a unit of blood every 2 to 3 seconds and most of us will need blood in our lifetime.